A masked protester runs near a burning barricade in the Monimbo neighborhood during clashes with police, in Masaya, Nicaragua, Saturday, June 2, 2018. More than 110 people have been killed in Nicaragua during clashes between forces loyal to President Daniel Ortega and opposition groups. 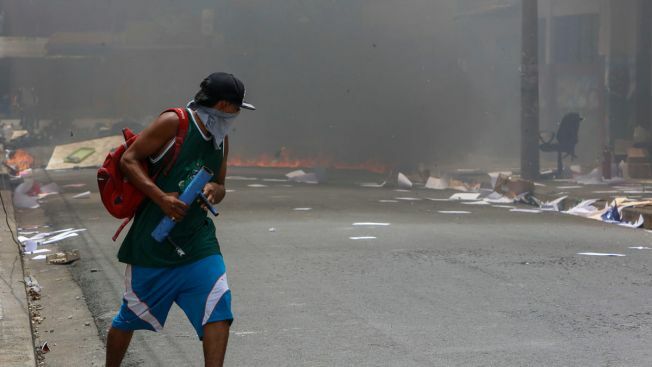 A U.S. citizen was found shot to death in the capital Saturday as violence and social unrest continue to grip Nicaragua. The body of Sixto Henry Vera was lying in a street beside two burned vehicles with a bullet wound to the head, the state forensic medicine institute said. Employees at the Managua bar owned by Vera, who spoke on condition of anonymity for fear of reprisals, said he left late Friday to help a friend who was being attacked. U.S. Ambassador Laura Dogu offered condolences via Twitter on Saturday to "the family of a U.S. citizen who died," saying the death of a U.S. citizen is of "great concern" for the embassy. Vera's death occurred at a tense time for Nicaragua. More than 110 people have been killed in the country since mid-April amid clashes between forces loyal to President Daniel Ortega and opposition groups demanding his removal. Streets across the country are often deserted after dark as armed groups circulate in vehicles without license plates, shooting and robbing. On Wednesday, more than a dozen people died in shootings that erupted around protests on Mothers' Day in Nicaragua. Gunmen firing into crowds sent thousands of demonstrators running for cover at the marches, which were led by mothers of victims who died in recent protests. Civil society groups alleged the attackers were members of paramilitary groups loyal to Ortega. Government officials blamed the opposition groups who are seeking to oust Ortega. The rise of criminal gangs has led residents in several cities to organize neighborhood watch groups with barricades. The Red Cross reported that two people manning barricades in the city of Masaya were fatally shot Saturday. "I beg the people of my city, Masaya, to not go out onto the street and to protect themselves in their homes, the situation is very dangerous," Managua's auxiliary Roman Catholic bishop, Silvio Baez, said via Twitter. Leading businessmen in Nicaragua have proposed moving up the presidential election that is now scheduled for 2021. Ortega has been president since 2007.